The commitment is part of the AFR100 Initiative under the Bonn Challenge. Dar es Salaam, Tanzania – WWF commends the government of Tanzania’s commitment, announced today, to restore 5.2 million hectares of degraded and deforested land. The commitment is part of the African Forest Landscape Restoration (AFR100) Initiative under the Bonn Challenge, a global effort to restore 100 million hectares in Africa and 350 million hectares globally by 2030. WWF is a technical partner in the AFR100 initiative. WWF-Tanzania has committed to supporting the Tanzania Forest Services’ efforts towards promoting restoration and tourism in the coastal forests of Pugu, Vikindu and Kazimzumbwi in the Dar-es-Salaam and Pwani regions. According to recent national statistics, Tanzania is losing an estimated 469,000 hectares of forest per year – a 25% increase from three years ago. In addition, the 2015 National Forest Monitoring and Assessment (NAFORMA) placed national annual wood deficit at 31% (19.5 million m3) with annual demand and supply topping 62.3 and 42.8 million m3 respectively. These statistics show that the country’s forests are continually under pressure to fulfill both domestic and international demand, which far outstrips supply. Meanwhile, land degradation in Tanzania has increased to 50% today, from 42% in the 1980’s. A recent assessment report by the Vice President’s office estimates that about 13% (125,000 km2) of Tanzania’s land mass is affected by land degradation due to poor farming practices, deforestation, overgrazing, loss of vegetation cover, soil erosion, soil pollution, and loss of biodiversity. Speaking during the initiative launch event, Tanzania Forest Service Chief Executive, Professor Dos Santos Silayo, noted that Tanzania intends to lead the way in reversing deforestation and degradation in the region and beyond. 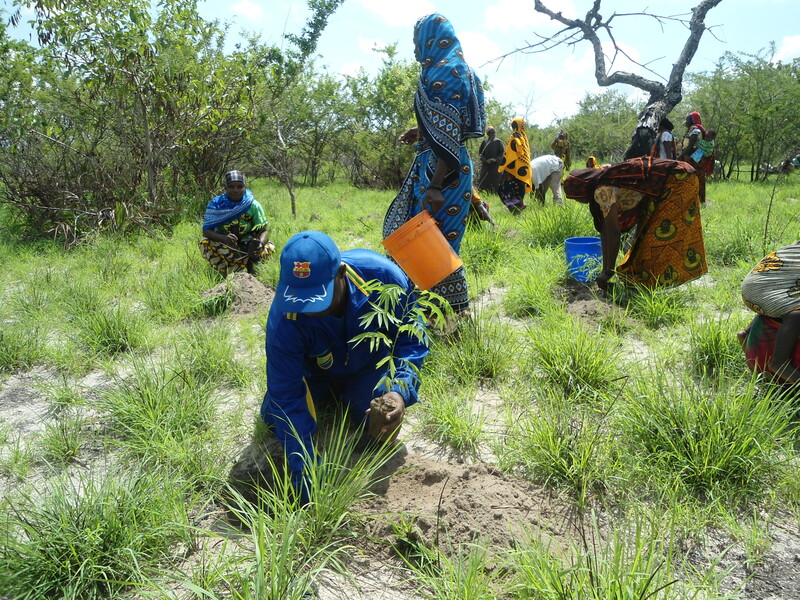 “Tanzania has joined other East African Community (EAC) Member States to implement the Africa Forest Landscape Restoration initiative, bringing the total area to be restored in the region to 16.5 million hectares,” said Prof. Silayo. Prof. Silayo further noted that this new effort would be an addition to ongoing initiatives to reverse the worrying trends in deforestation and degradation in Tanzania and the region. “The announcement today is not new in Tanzania as it builds on previous and ongoing efforts implemented by government and partners for over 20 years through the National Water Sector Development Programme, the National Forest and Beekeeping Programme (NFBKP II) and Zanzibar’s Long Term Forest Resources Management Plan,” he noted. The AFR100 is a country-led effort which was endorsed at the African Union (AU) heads of states summit in October 2015. It is aimed at supporting countries realize several international commitments, including the Sustainable Development Goals (SDGs), UN Convention of Biodiversity (CBD), UN Convention on Combating Desertification (UNCCD) and the Paris Climate agreement of which Tanzania is a signatory. Tanzania joined the Initiative in January 2018 through its Ministry of Natural Resources and Tourism (MNRT) and the New Partnership for Africa’s Development (NEPAD), secretariat to the AFR100 Initiative. Forest landscape restoration is a critical part of WWF’s strategy to create a world enriched by extensive, resilient forest landscapes benefiting biodiversity, people and climate. WWF aims to translate a number of Bonn Challenge restoration pledges into financed actions under implementation so by 2030, 350 million hectares of forest landscapes are restored. WWF estimates that 40% of the world’s forest could be under high degradation risk by 20305. High levels of degradation undermine forest and land resilience to climate change and hence have negatives impacts on livelihoods. Across the globe, WWF is pleased to note an increase in political will by governments, as demonstrated by commitments to restoration, new technical partnerships and increased financial commitments. This is a clear indication that there is undoubted recognition that restoration is an important approach to address the rising threat of climate change and particularly the impacts it poses to local livelihoods. 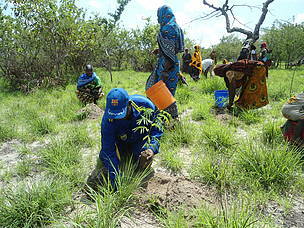 A tree planting exercise by Coastal Communities in Tanzania.